Easily create, edit and manage your entire event online! You don't have to be a computer expert to create your event's online registration system. The Driven's software is easy to use yet extremely powerful and fully customizable. 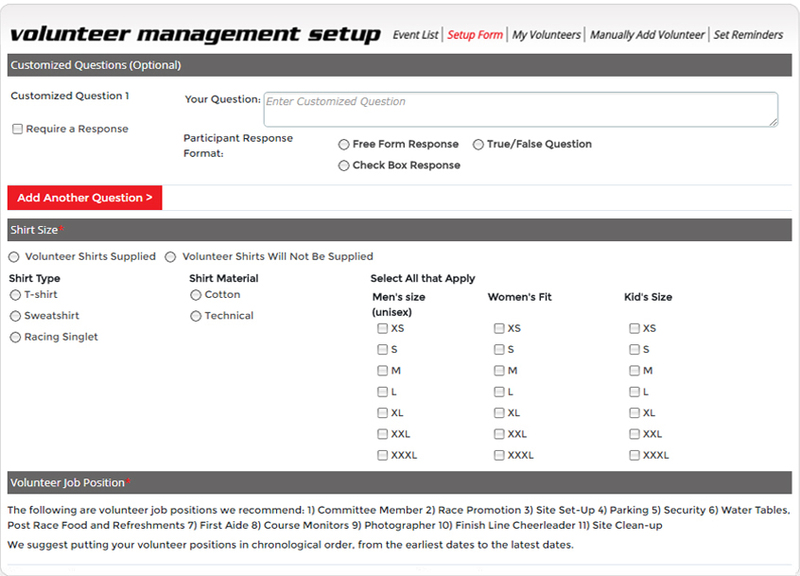 Setting up your event--including registration, multiple registration periods, adjustable event / sub-event fees, discount codes, customized event giveaways, volunteer management, donations, and fundraising options for multiple sub-events/events for one event--is as simple as filling in the blanks. Our platform is set up for sporting events such as running, cycling, swimming, and multispot events as well as other events such as golf or bowling tournaments, soccer clinics, and much, much more. Whether you are a seasoned event director or this is your first event, you'll find The Driven's step-by-step event set up easy to use, customizable, and visually appealing. After completing your basic event information in Step 1, you will see that we are capable of handling any type of event. From racing events to dog events to tournaments, The Driven has you covered. For runs/walks, you can specify the distance and indicate whether it is a relay. For multisport events, simply create the combination that matches your event. Have multiple races/sub-events within your event? Simply click on the Add Another Race/Sub-Event button on the bottom left of the screen. Also in this step you have the ability to specify event/race giveaways, upload giveaway images for the event registration site, and differentiate giveaways for races/sub-events within your event. With this feature, not only will participants be able to view the shirt, medal, or any other "swag" they will receive from your event, but our platform will also keep track of your event giveaway totals so that ordering your giveaways is a no-brainer. 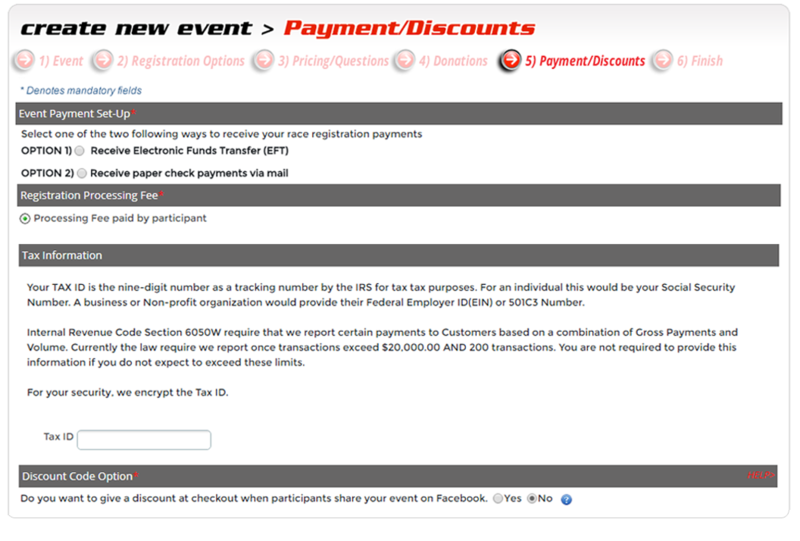 The Driven's registration and participant questions feature gives you a great deal of flexibility to customize your event even further. Here, you can select up to three registration periods in full graphical calendar format as well as set specific fees for each period, all while having the ability to charge different fees for each race/sub-event. For example, you might set a lower fee for early registration and a higher fee for late registration, and a marathon fee will be more than a half marathon fee. In this step, you also have the capability to ask a variety of questions to your participants such as birth date, estimated finish time, as well as custom questions you create. The customization continues as you decide whether a response is required and you can differentiate your questions for multiple races/sub-events within your event. This feature is critical when specific participant information is needed such as predicted finish time for start corrals. You can also opt to add additional items for purchase, here such as parking passes, raffle tickets, extra T-shirt and more. 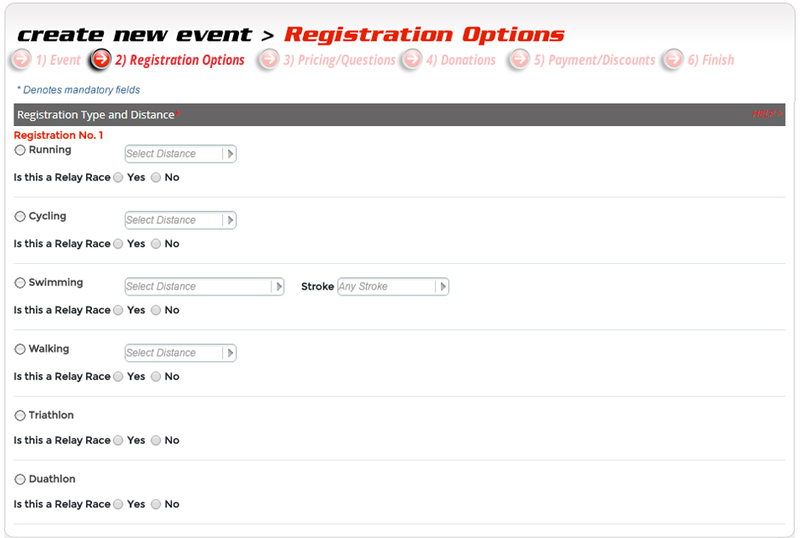 Finally, you can choose whether your participants can view who else has registered for your event. With The Driven, an event/race director can choose to have its registration, extra item sales, and donation revenues wired directly into the event's bank account or receive a paper check in the mail. For added flexibility, you can select whether to have The Driven's low fees taken directly from the registration revenues or have the fees paid by the participants. Need to provide certain participants or groups with a discount code? The Driven's platform offers a variety of discount options that you can customize for each race/sub-event. You can select whether the discount is a percent off or a dollar amount off, the start and end dates of your discount(s), and you can limit the discount(s) to a certain number of registrants or a certain type of registrants, such as new customers or early bird registrants. We've been event coordinators/race directors before, and we know that options and customization are critical to the registration process. Should you need large numbers of unique discount codes for a special case, The Driven can definitely work with you to deliver. Now that you have customized all facets of your registration and payment processes, you are ready to close the deal. 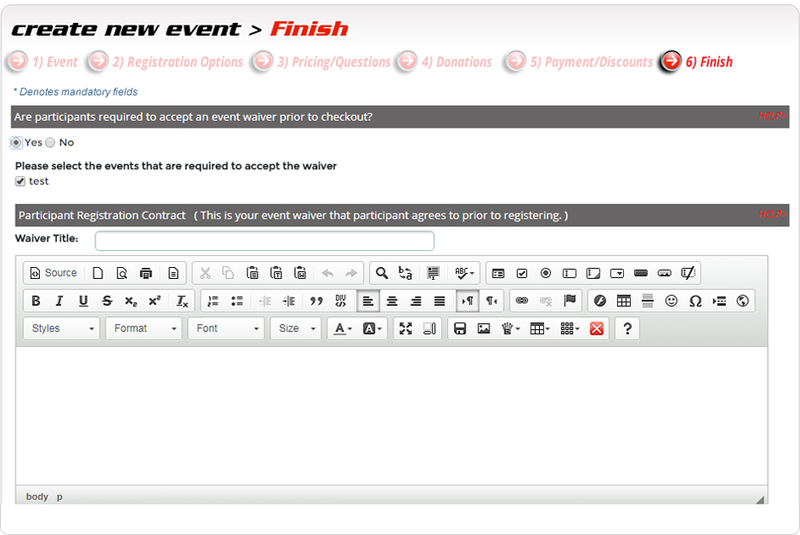 On the finish page, you can upload/ include your participant waiver and format a customizable registration confirmation email, and even decide whether you/your event sub-administrators will receive an email notification when someone registers for your event. You will also be prompted to select theme colors and whether you want to have a QR code generated for your registration page. Before going "live", you can preview your registration page. 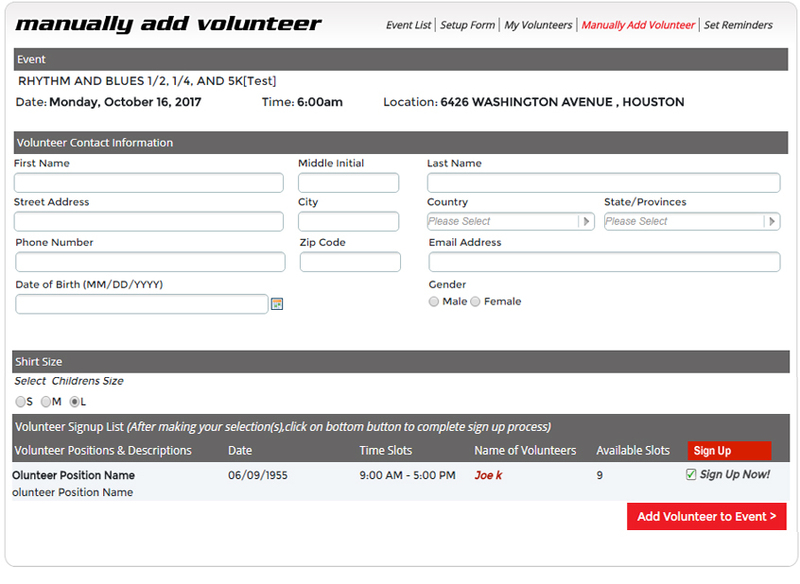 Remember that we provide complete Event Solutions with our Volunteer Management and Fundraising features. These features can be seamlessly integrated into your event with a few simple clicks. 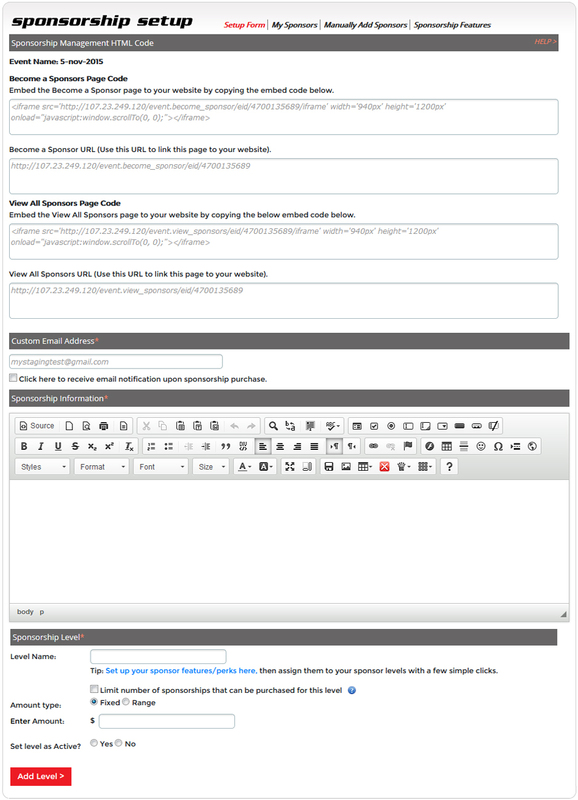 When you are ready to open your event page to go live, simply click "Save and Publish". Doing so will also feature your event on The Driven's searchable Event List. Your event will be assigned a unique URL which can be integrated into your HTML page. If you encounter a problem or have questions, simply Contact Us for prompt, personalized service. Whether you want to host an online stand alone fundraiser or integrate fundraising into an event such as a fun run, The Driven is committed to helping you achieve your goals with our customizable fundraising platform. Continue the tour to see sample fundraising features. With The Driven's fundraising platform, you can customize every aspect of your fundraising efforts. Start by describing your worthy cause, then decide how to thank your donors with a custom, automated email. You can get creative by creating unique donation levels or use our default levels-the choice is yours. Add graphics and pictures to your fundraising page to help donors "see" the cause they are supporting. Finally, decide if you want to receive email notifications of donations and let us know where to direct the funds. You can then preview your fundraising page before it goes live to make sure it's just how you want it. 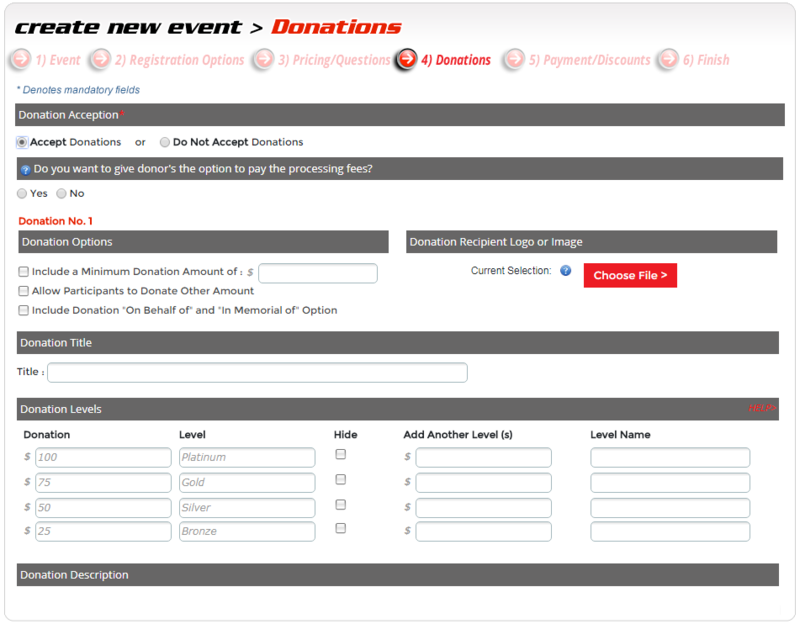 On your customized fundraising page, The Driven provides a tab for you to let your donors and sponsors know all about your event, your cause, your mission, and how your funds will be used to support your mission. A progress bar at the top keeps everyone, including you, updated on your fundraising efforts in real time. 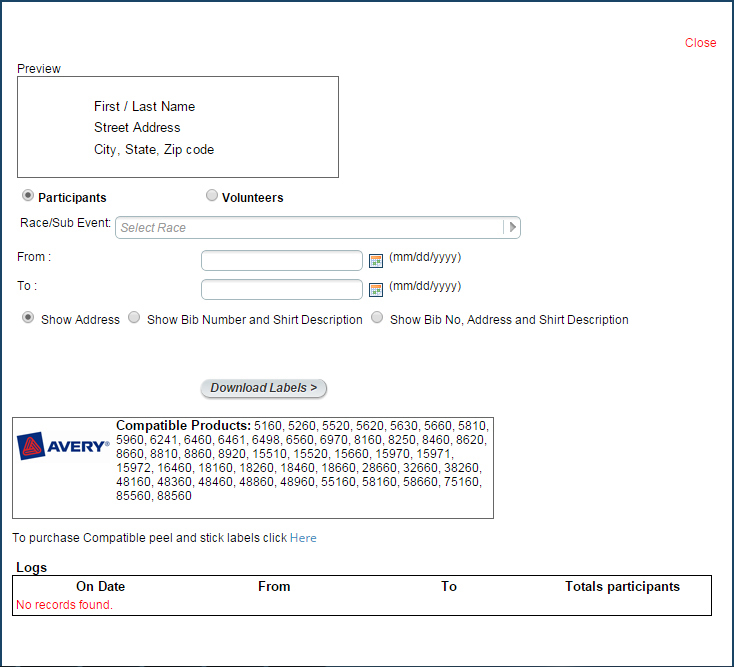 The scrolling bars on the left show top fundraising teams and individuals to keep your participants engaged. Fundraising is easy with our searchable database for team and individual fundraisers. Donors can also make a general donation for even more flexibility and expanded fundraising potential. With The Driven's advanced fundraising platform, your participants can set up personalized team and/or individual fundraising pages complete with pictures, customized text, a fundraising progress bar, a scrolling list of contributors, as well as links to social media. Most importantly, with our integrated fundraising platform, while your users will be able to see your fundraising progress on your site, which is updated instantly and constantly in real time, you will be able to track your fundraising efforts with detailed reports provided for you in your account. You'll also have the ability to communicate with your donors as well as your fundraising teams and individuals using our communications tools to share the good news about meeting your fundraising goals with The Driven by your side. The Participants feature is just one more example of the the paramount online tools The Driven provides to you for effective event management. With our summary reports, you can view your participants' registration information, including contact information, age/geneder, sub-event registration information, giveaway details, as well as responses to your custom questions. You have the option to view your overall event participant list, or you can view reports by sub-event. As with all of our report tools, the Parcipants summary report can be easily downloaded as a spreadsheet for further manipulation and sharing as need. Adding participants manually is easy with The Driven. 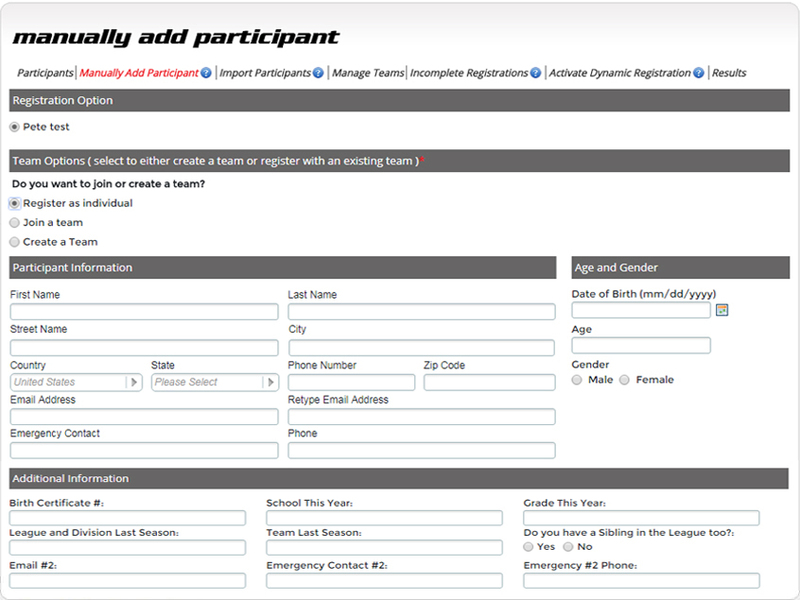 Simply click on the Manually Add Participant tab and enter in the participant's information and then complete the registration by clicking the "add participant to race/sub-event" at the bottom right. 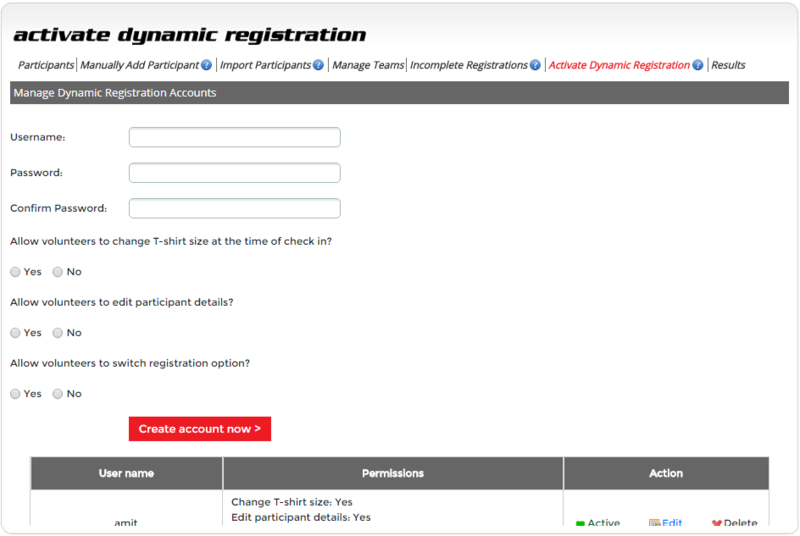 Manually added participants will automatically and immediately appear in your participant summary reports, as will day-of-event registrants, using our Dynamic Registration feature featured on the next page. With The Driven's Dynamic Registration tool, you can provide onsite event day registration for the ultimate in flexibility. 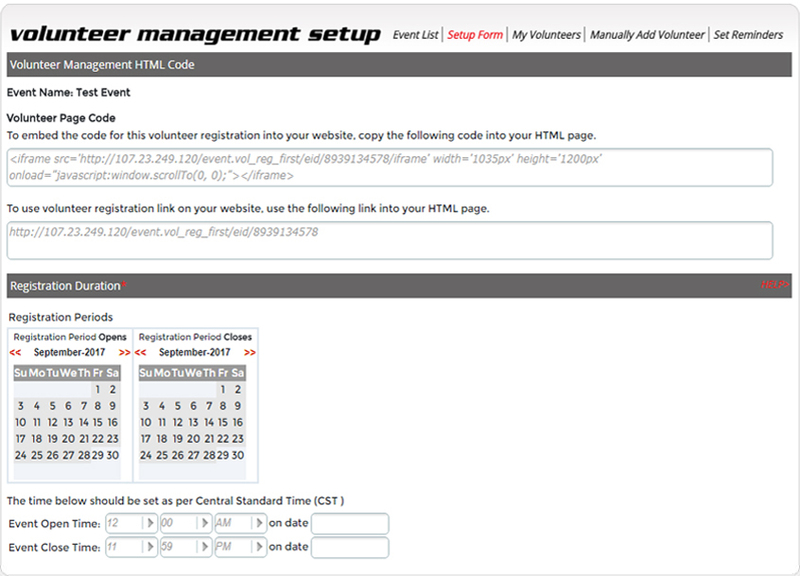 Not only can you have new participants register via a unique URL created for you when you set up Dynamic Registration, but you can also have current registrants update their T-shirt size, edit their contact details, and their sub-event selection. With Dynamic Registration, your new participants can be assigned bib numbers and are added to your participants database in real time. Use our Timing Integration tool to allow timers to access data at any time, to download participant data directly into the timing software reducing errors, to assign bib numbers nightly for larger races with multiple packet pickup days, and to enable race day registration without needing to manually enter last-minute registrants into the timing system. 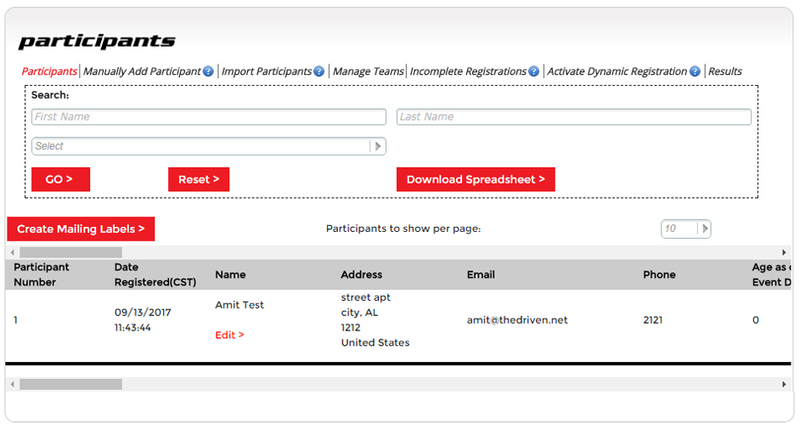 Keep all of your participant data in one place by adding your results into your event account. 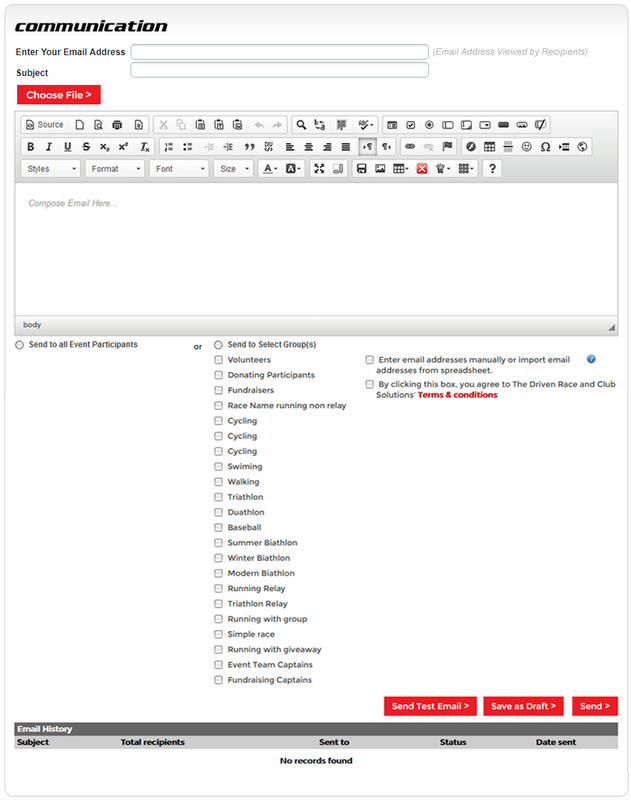 In addition to sending customized emails to your participants using our Communications tool, you can easily create customized mailing labels to mail events and more, and it's compatible with dozens of Avery label products. With The Driven, staying in touch with your participants is fast and easy. Event/Race Directors know that volunteers can make or break an event. Participants appreciate and notice when an event is staffed with an adequate number of friendly and knowledgeable volunteers. Unlike our competitors, The Driven realizes how important recruiting and managing volunteers are to the success of your event. That is why we don't send you to another vendor or site for your event's volunteer management. 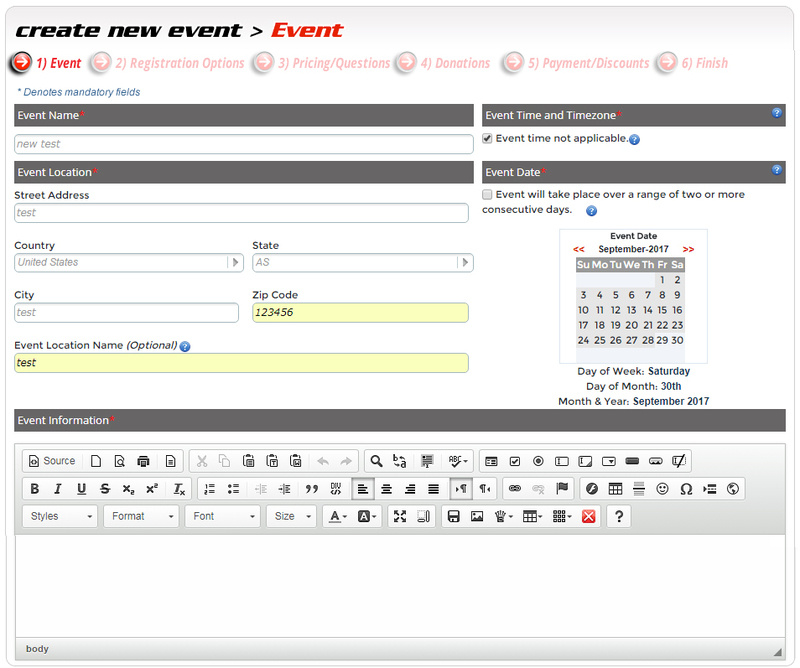 We have created this system with you in mind, making it as easy to use and personalize as our event set up tools. Once you have created your event, Volunteer Management customizable section where you can create your volunteer sign up page with all of the key details needed for your event's success. In addition to creating custom questions for your volunteers, you can opt to include giveaways for your volunteers, and our system will tally up the counts for you in your summary reports. Next, you'll set up volunteer positions, descriptions, and time slots, and you can even set the number of volunteers needed at a given position. Finally, use our default volunteer sign up confirmation email or customize the text as you wish, then use our preview feature to check things over before you save and publish your integrated, customized volunteer sign up page. Keep tabs on your volunteers by clicking on the My Volunteers tab to who has signed up for which positions so that you can be ready for your big event. In this feature, you can click on a volunteer's name to see his/her contact info, manually add volunteers, and download all of your volunteer information into a spreadsheet. Keeping in touch with your volunteers is breeze with our Communications feature where you can craft an email message to remind your volunteers of their upcoming shifts and thank them for helping make your event a success! 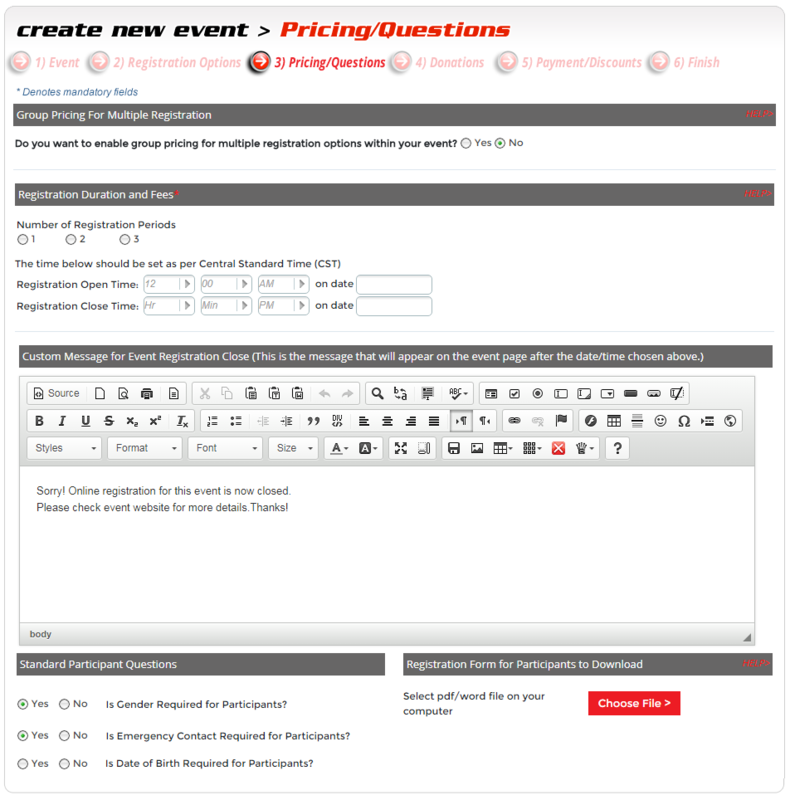 Streamline all aspects of your event by adding online sponsorship sales to your event set up. 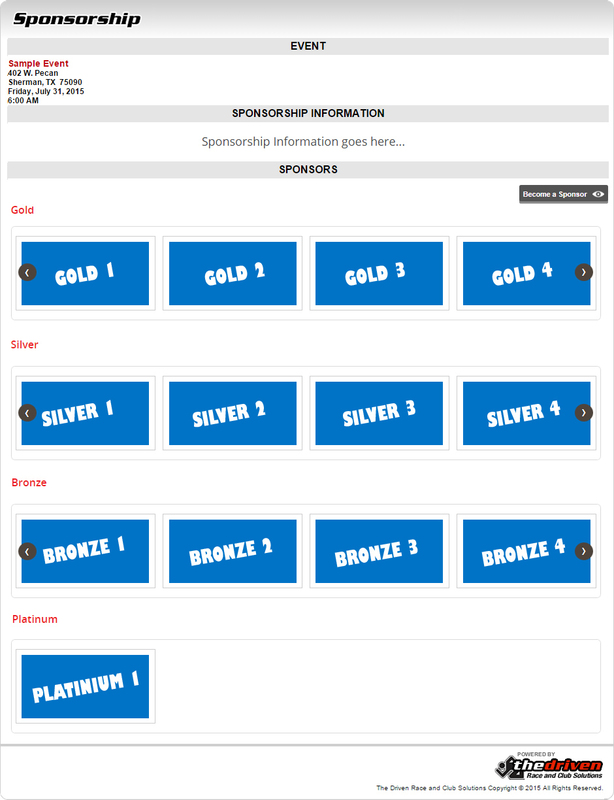 The sponsorship module is integrated with your event registration at no cost to you and automates the addition of sponsor logos and links to your event page. Quickly and easily add sponsorship levels and features/perks for each. 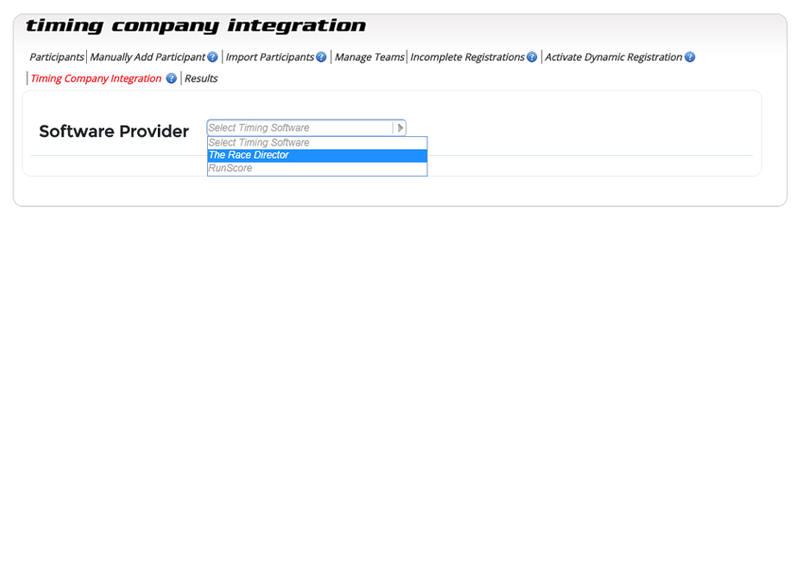 You can even opt to limit the number of sponsorships purchased for a certain level. Once the limit is reached, the purchase button will be disabled, but the level will still be displayed with a "sold out" note. 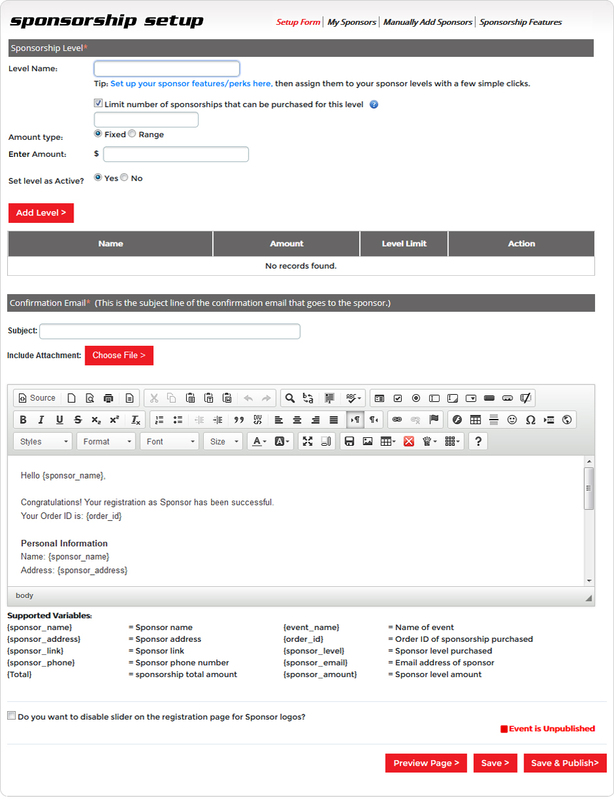 You'll be able to configure a customized confirmation email to your sponsors, as well as reach them via our integrated Communications platform. Sponsorship purchases will be reflected in your My Financials reports. Once your sponsor has completed their transaction, their image (linked to the website they provide at checkout) will automatically appear on your sponsorship page and update in real time. You can disable the slider of images at any time. With The Driven, customized online sponsorship sales are easy and time-saving, allowing you to focus on other aspects of your event. Keeping in touch with your participants-whether you want to send a message to all of them, just your volunteers, or just participants of a particular registration option-is simple with our powerful, free-of-charge communications platform. Want to send an e-blast to past participants to invite them back for your next event? Simply upload their emails from your spreadsheet file and you are on your way. From seeking volunteers to updating participants about last minute changes to thanking your fundraisers and donors, The Driven's communication tool makes staying connected simple, fast, and as always, customizable. With the My Financials feature, The Driven gives you 24/7 access to your event's financial reports. You can view your reports for your entire event or by particular registration option. Your financial statement will show you total event fees, donations collected, sponsorship transactions and fundraising results. 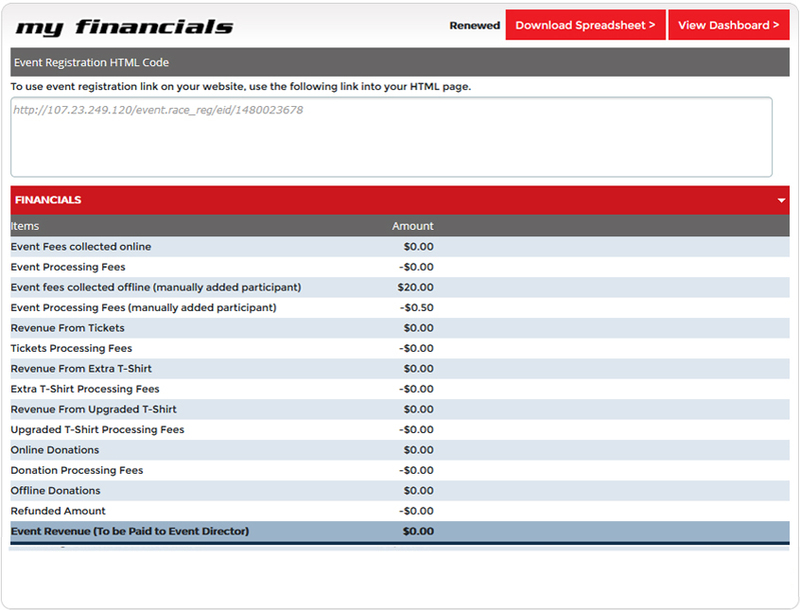 You'll also see a history of your event payouts with your selected pay option. Your financial report can be downloaded to an easy-to-read spreadsheet, enabling you to easily share with your event committee as needed. 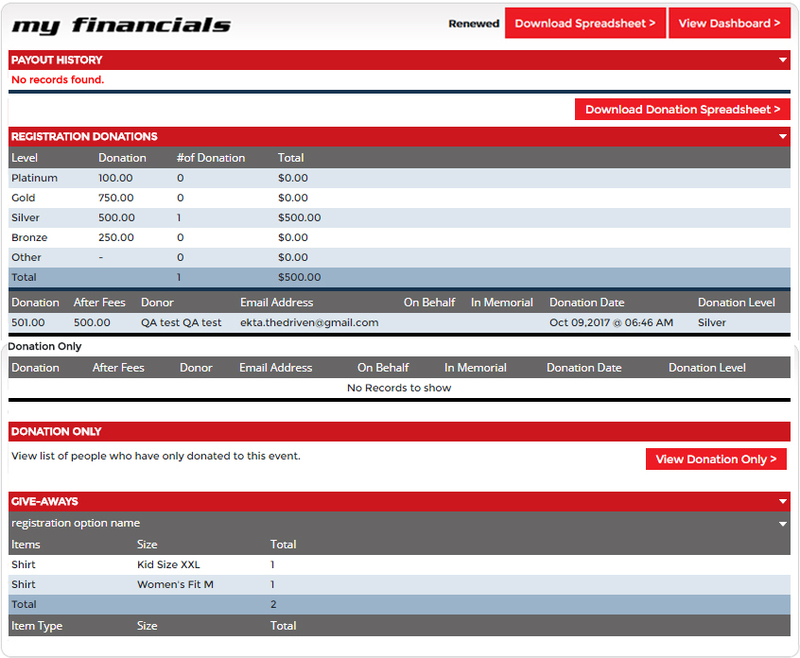 In the My Financials tool, The Driven also provides a detailed report of your race giveaways for races/sub-events, volunteers, and extra ticket items, saving your time and making it easier for you to order for your event. Download the report as a spreadsheet to share with your event committee as needed. Stay in the driver's seat with The Driven!